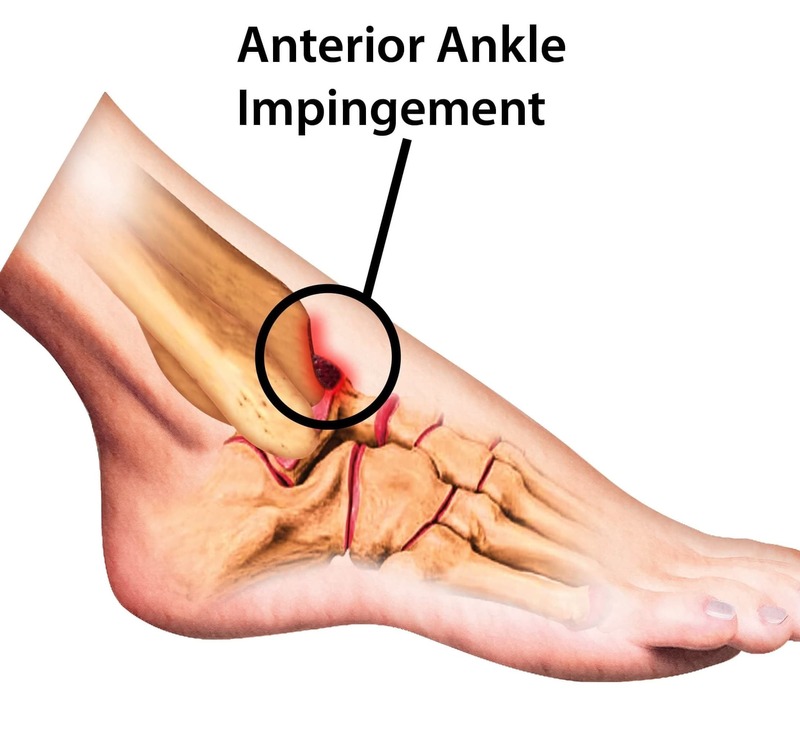 An anterior ankle impingement is usually the medical term given to problems at the front of the ankle (OGS). It occurs when certain portions of the joint between the bone and other structures in the ankle are restricted causing discomfort and pain especially when the individual moves their foot upwards (dorsiflexion). In an anterior impingement of the ankle, it is important to distinguish between the two forms that can occur. There is the soft tissue impingement, as well as the bony impingement. Soft-tissue impingement occurs when structural pieces are either restricted or more than they should be. Bony impingement is usually due to congestion in the formation of new bone (bone spurs). The main area of occurrence is usually the talar neck or at the front edge of the tibia. A common occurrence is the clashing of the talus and the tibia, resulting in the clamping of tissue in between. In most cases it is the result of ankle arthritis, as the inflammation at the portion of the ankle causes more blood flow to the region, resulting in bony outgrowths (osteophytes), which can also be caused by recurrent small injuries of the anterior ankle capsule. There are also ligament injuries, ankle fractures and cartilage bone injuries in the ankle that can contribute to ankle impingement. Thus, the affected foot cannot lifted without the individual feeling some kind of pain. Even rolling of the foot or climbing stairs may cause pain. Depending on what position the individual positions his or her foot, the symptoms can lessen or intensify. If an individual suspects that they are suffering from anterior ankle impingement syndrome then it is essential that they seek clinical help and examination from a qualified specialist. The doctor will usually examine the joints in the ankle and verify its mobility and degree of pain. These imaging techniques can identify possible changes in the ankle formation, bone fractures or soft tissue growth. In some cases, for the diagnosis oto be thorough, a surgical arthroscopy (arthroscopy) may be required. Since other symptoms such as a bursitis, a inflammation of the tendons, cartilage injuries or broken bones can cause similar complaints at the ankle, these have to be excluded from the investigation. The treatment of ankle impingement can either be conservative or surgical depending on the severity of the injury. This type of treatment usually involves the immobilization of the ankle; in addition the patient will usually be referred for special physiotherapy exercises. Non-steroidal anti-inflammatory drugs (NSAIDs) or injections, are usually administered to help with the pain. If an operation is required, this is usually carried out in the form of an arthroscopy. The procedure will usually take about an hour to perform. Before surgery, the patient will receive either a spinal or general anaesthesia. Following the operation, an intensive physical therapy is required to ensure the ankle can heal properly.